Found some gaming news and want to share it with fellow retro gamers? Discuss your news in here. Hi,here there is a link to download a demo of Matteo's Land,a new giana sister hack and here there is a link to watch a gameplay of this game. In Shadow Fight 3 game which is the newest game in the series of Shadow Fight, You will command and control a ninja character. You have to fight without giving up in this battle where you will struggle to survive against your enemies. During the game you will see enemies who want to kill you. You have to fight against these enemies. According to the success of your performance, some auxiliary tools will be opened for you. You can also use auxiliary tools such as ax, knife, and other materials. the mods moved this post here form its own topic, but you guys should know this is NOT an indie game I'm working on, as originally stated it's merely a mock up game I made bits and pieces of in MMF just for this trailer, I'm an artist not a game programmer so that's all this is. The artistic aspect is what matters here, since my classes have nothing to do with programming and such. I'm in grad school now, my final year and this is part of a bigger project. - I only used the 16 color C64 palette and worked with that, no cheating, no anti aliasing, no smoothing, tho you can't quite see that due to the poor video quality of course. Wish I could turn this into an actual game, I mean what you see there IS gameplay and me playing it but it's not polished enough to be a fully fledged game. Last edited by ShinigamiKiba on Tue May 09, 2017 4:46 pm, edited 1 time in total. MAJOR UPDATE!!!!! - I made my own custom CRT Filter after all and added it, what do you think? PS: hope I posted in the right area since I have not found the section "Online game"
Is there an easy way to find Physical Release kick starters? Eg Wii u or Dreamcast. Some kind of filter? Wanted WII U : Lego Marvel Super Heroes ( Iron Patriot minifigure) and Lego The Hobbit (Bilbo Baggins minifigure). turn based strategy (like Battle Isle) for mobile phones? I loved to play the classic round based strategy games like Battle Isle on my Amiga back in the nineties, and was looking for a similar game to play on my mobile phone, but did not really find something. I only found really bad portings of PC remakes, which even need double clicks and crash after seconds. Alternatively I found games made without any love, where the units are just pictures always facing to the right, and even shooting to the right, even if the target is left, or even worse: where the fight isn't even animated, but shows you a text with the created damage points. Alternatively I found games, which just try to much. Too modern graphics, some even 3d. Still round based, some also might be fun, but without the soul of these old games. And most of these try to annoy you to buy something all the time. After all these disappointments, I decided to learn android programming and started to create my own turn based strategy game. Just for fun and for myself. But now that it basically works, I'm asking myself, if I should make it a complete game. It's absolutely no direct copy of these classic games, but a unique game inspired by them. It keeps pure retro graphics and the classical feeling, but combines it with actual technologies like absolutely being made for touchscreens, zoom, easy online gaming and so on. The engine is finished, even round based online gaming works. But to make it a user-enjoyable game, with lots of levels, units, tutorials, descriptions and so on, I am at a point, where it would really need me to invest all of my free time and some money for online services, buying legal sound effects and so on. It's actually based on free stuff, which I can't use in a public release. So before I do this large steps, I would like to know, if anyone is interested, or if I would just waste my time and money? 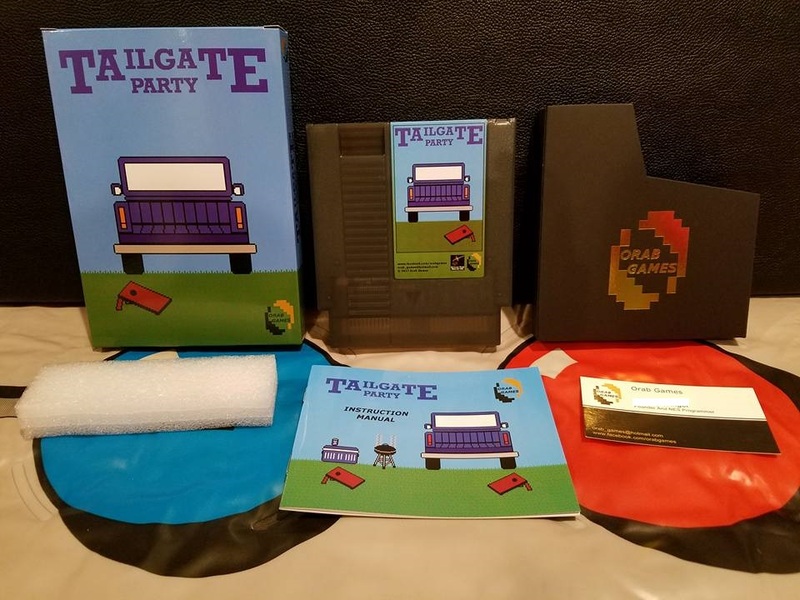 I wasn't really for sure where to post this but I wanted to let you guys know that my new NES game, Tailgate Party, was released on June 1st. It uses the buttons on the Power Pad as targets for corn\bean bags. The game feature a single-player story mode as well as a multiplayer mode! It uses Membler Industry GT-ROM boards with flash memory to save your progress. Sorry if this is the wrong spot, I wasn't really sure where to post outside sale links or announce my game release. Feedback so far has been very positive. I'm programming an adventure of Lolo clone, with a few changes to the gameplay. Was there anything in the game that players really hated, or would have done differently? I'd love some feedback on how to improve upon that game. There's not a lot of similar games out there. Re: So I made a game ! The Kickstarter campaign for Volume 2 is officially launched. Actually rocking 10K! New MSX2 game - INFERNO is now released! Inferno for MSX2 is now available from the Aetherbyte Website. Currently a ROM version is available, but a cartridge version with printed manual is in progress and will be finished soon. I’m here to share with you a game we made for all Castlevania fans. The game is Castlevania The Lecarde Chronicles 2! We released this game in April 2017. I’m sharing it with you now because we will soon be releasing footage of our next game, an original called Wallachia Reign of Dracula. LC2 is an open world metroidvania with over 10 hours of gameplay. We had a great cast of voice actors in LC2, including actors from official CV titles such as Robert Belgrade (the voice of Alucard from Castlevania Symphony of the Night). If you like what you see please follow us on twitter and Facebook! We look forward to sharing more about our next game Wallachia Reign of Dracula soon! Wishing you all the best with the campaign, looks good. I'd support something like this if it was for a console? Is there a consideration for the PS4 or similar alongside Steam? I have been developing my game for about 18 months, its called Xenosis: Alien Infection and its based on a love of one of my all time favorite Amiga games, Alien Breed. I just don't think there are enough top down games these days, although having worked on one for so long now, its easy to see why, they aren't the easiest in the world to make (immersion is tough from that view perspective), but I have tried to make a 2D game have real 3D depth with the use of lighting & shadow, and I think it worked really well! Xenosis is coming to Steam (PC, Mac & Linux), Xbox One, PS4 and Switch, early 2019 if all goes according to plan. I'm currently hard at work updating the AI, as its a pretty complex system that incorporates hunting and group behaviours, along with simulating senses which makes for a really interesting experience. I also love talking game design, development and techy stuff, so if anyone wants to chat more that would be awesome! I hope you don't all mind, but I have spent a long time creating a card game based in retro games and I decided the best way to get it made is by Kickstarting it. I poked fun at old games and consoles and it I don't say so, it's pretty funny. So please, if that sounds like something you might be into, go visit the Kickstarter. Hunt wizards in a retro-futuristic vision of the retro future. Collect ammunition to obliterate giant demons with your powerful explosive weaponry.